A militant Islamic group in Northern Syria, Islamic State of Iraq and Syria (ISIS), is demanding Christians living in the region pay a ‘protection tax’ to make sure the militants won’t kill them. The ruling affects the province of Raqqa. Al Raqqa, the provincial capital population 300,000, fell to rebel insurgents in March 2013. 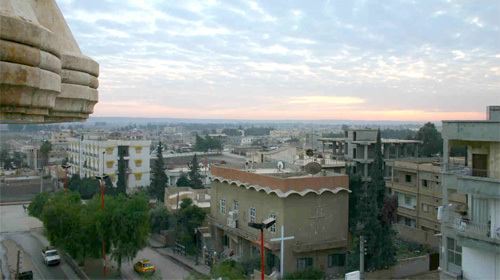 Prior to the Syrian civil war there were 3,000 Christians living in Al Raqqa. According to reports, ISIS is requiring every wealthy adult Christian male pay a Jizya tax of four golden dinars, middle class males two golden dinars and poor ones, one dinar. Four golden dinars is about $750 US. They can pay the tax over two payments. The tax is found in the Qur’an, (Sura 9:29) and is part of ‘dhimmi’ status given to non-Muslims. According to Nina Shea, Director of Hudson Institute’s Center for Religious Freedom, the Islāmic terrorist group has set up a Caliphate, with rules similar to those established by Caliph Umar in the seventh century. It allows “People of the Book,” Christians and Jews, to coexist with Muslims but treats them as ‘dhimmi,’ literally protected minorities and second class citizens. Over the centuries, those with ‘dhimmi’ status actually have a contractual arrangement with their Muslim captors. This contract is required under Islāmic Sharia law. The Christians signed a contract agreeing to become “dhimmi” which was then posted on Facebook. Christians must not hide their wealth — in other words pay the tax that is owing. Women, similar to the Muslims, are required to wear a full hijab, a black covering with just a slit for the eyes. Christians are not allowed to openly display elements of the Christian faith, such as crosses. They are free to worship privately in their own homes and public buildings previously used as churches, provided no Muslim can hear them. They are not allowed to repair any churches/monasteries damaged during the civil war, nor are they allowed to build new structures. They cannot read scripture or openly show their faith outside the confines of their church or homes — this includes weddings and funerals. They can say nothing derogatory about the Muslim faith. They can eat pork and drink alcohol, but must do it privately and must not offer it to Muslims. They can not object to any Christians converting to Islam. They are not allowed to aid any of the enemies of ISIS and must report any enemy activity. Breaking any of these rules could invalidate the contract and leave Christians open to attack. However, it does not protect them from attacks by other competing Islāmic groups in Syria. It is estimated there were about 2.2 million Christians in Syria (population 22 million) before the civil war. About half a million of the Christians have left Syria due to the oppression and over 1,000 killed. The news of this tax comes on the heels of a report, that traditional Catholics are demanding a similar payment from Evangelical Christians in the village of Union Juarez, Mexico. In this case, they are requiring a payment of $38 US from each person attending Mount Tabor Evangelical Church to help pay for Catholic festivals in the village. When members of the church refused to pay, the Evangelicals had their water and electricity cut off by the village. At one point their homes were even roped off and guards posted to prevent them from leaving their homes.